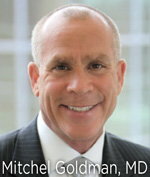 Dr. Mitchel Goldman: When I think back on my career in phlebology, it really all starts with you and founding the North American Society of Phlebology in August of 1985, incorporating the Society in June of 1986 and having our first annual meeting in February of 1988. It was your vision, so, Anton, could you first tell me a little bit about why you came to the United States and how you got interested in phlebology? Dr. Anton Butie: Well, I was trained in Switzerland in internal medicine, then in angiology with Professor Bollinger. I was also trained in phlebology but I came to the United States because of research in the field of microcirculation. That brought me to the University of California, San Diego (UCSD) with Professor Intaglietta where I studied for a year in 1976 and then I went back to Switzerland to complete my specialization in internal medicine and returned to the United States in 1979 when I had to pass the federal licensing exam, a difficult test for me. Then I started practicing together with Dr. Arnost Fronek and he actually said there was a lack of knowledge and expertise in the field of phlebology. So I decided to start a practice with that specialty and got an immediate response. I think that’s how we probably met, at our first meeting in 1985. There was a group in New York that already had some sort of a society founded, but I didn’t like the level of scientific knowledge in that group so I decided to start our own group together with you and some other members. There were about 14 at the first meeting. Mitchel: I remember in August of 1985 we had our first meeting of 14 founding members, and I remember Drs. Arnost Fronek, David Duffy, Peter Goldman and a very famous dermatologic surgeon, Sam Stegman, were there as well as others specializing in treating veins like Dr. Gabriel Goren. It was an interesting meeting. Anton: I just wanted to share my knowledge that what I saw wasn’t present yet in the United States. At that time most of the surgeons who did vein surgery would operate in such a fashion whereby female patients were very unhappy with the cosmetic results. Also, the use of the Doppler ultrasound was something that wasn’t widely known and not used for evaluation of varicose veins, so I wanted to share my knowledge to improve patient care. 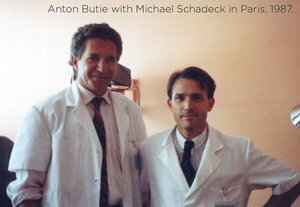 Mitchel: You know, Anton, I think your greatest accomplishment was sharing your advanced techniques to optimize patient care because before you started bringing us together to share knowledge, the practice of sclerotherapy and phlebology was almost secretive. I remember a physician in Los Angeles who would concoct his own special sclerosing solution and wouldn’t tell anyone what was in it. I remember that physicians in New York would also not tell anyone how to perform sclerotherapy because they just wanted people to send patients to them. I think when you founded the North American Society of Phlebology, by bringing members together, it was to share information in a very unselfish manner and that’s something you really need to be congratulated for. Anton: Thank you. Yes. I think that’s my nature. I think we should all work together to achieve better results for the patients and I think you continue to do that. Mitchel: Well, I do it with your inspiration, my friend. Going back to you coming to the United States, what was your primary research interest when you were working with Dr. Fronek here at UCSD? Anton: There were two aspects. What do we do with the bigger varicose veins and what do we do with the more cosmetic, small telangiectatic disease type veins? For the bigger veins, it became clear that the French had the best approach because they would inject from the top down, meaning they closed reflux at the highest point, whereas the Swiss, where I came from, would start at the bottom—meaning at the ankle area—and then sclerose the veins going up towards the groin. This was one of the first questions—which one gives better results? Which one has a better cosmetic outcome? And which one requires less compression and/or is more agreeable with the patient? The other one was, of course, the cosmetic veins. Many dermatologists just treated cosmetic veins but ignored the underlying disease of the varicose veins, thus sometimes resulting in poor results and discoloration. That was another field of interest—how or when to inject the telangiectasies and inject them in such a manner, and with such substances as to minimize the pigmentation. Mitchel: Yes, and I remember you teaching me how to inject larger varicose veins by using butterfly catheters with the leg dependent, raising the leg to empty the veins of blood and then doing the injection and getting incredible results. Anton: Yes, it was very important that the vein was empty when you’re injecting the sclerosing agent and, of course, adding graduated compression. Mitchel: I remember when you first started the North American Society of Phlebology, which is now known as the American College of Phlebology. You literally ran the Society from your office with your secretary, Connie. How much time did you spend trying to form this? Anton: That’s difficult to say. I’m sure I spent an hour a day just doing whatever was necessary, like writing and reaching out to other physicians. Later I started a workshop for doctors to come in to my practice and I taught them in a five-day course how to do this treatment. Mitchel: How many doctors do you think took your five-day intensive course? Anton: Well, probably 30. I liked one-to-one teaching. It was, for me personally, very interesting to do it that way. Mitchel: That’s been one of your greatest attributes. Not only your ability to share what you know, but to interact personally with those around you, making every person feel like it was a special experience. I see many of your patients, even today, who always ask me how you’re doing and always have fond memories of your sclerotherapy treatments from 20 years ago. Anton: That’s very nice to hear. Mitchel: Anton, the other part of phlebology that you taught me, and that you were very interested in, was photoplethysmography and, of course, the use of the Doppler. Could you talk about your use of those two techniques? Anton: I think the Doppler ultrasound is very important to diagnose the blood flow in leg veins, especially the bidirectional ultrasound, which enables you to distinguish the flow to or from the probe. This helps to analyze where the underlying problem is, e.g. which communicating veins are leaking blood to the superficial veins, or which one of the larger superficial veins has insufficient valves. I think that’s the most important instrument. Photoplethysmography was an easier test to determine that also, but I like the ultrasound best. Mitchel: Anton, if you could think back on maybe one significant experience in your long career, what do you think had the greatest impact or stands out the most in your career of phlebology? 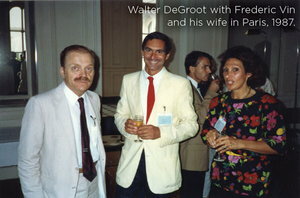 Anton: I think the support of Dr. Walter DeGroot, a vascular surgeon from Seattle was important. In the beginning, when we decided to start our own society, he insisted on a strict scientific approach and that we bring the experience from the European countries to the United States. He had connections to French phlebologists, which later resulted in a one-week workshop in Paris. This became both an important part of the training and an important support of the Society’s development. 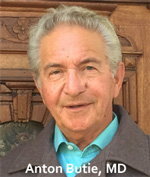 Mitchel: Yes and I recall the first workshop in Paris by Dr. DeGroot was in September of 1987. Anton, do you have any last comments for our readers? Any advice for young physicians just starting in the field of phlebology? Anton: To fully diagnose the cause for the varicose and telangiectatic veins before they treat, to use graduated compression and read up on the newest developments in diagnosis and treatment. Mitchel: You moved back to Switzerland in 1996 but you gave your American colleagues a good first 10 years founding phlebology in the United States. Anton: I’m glad I gave it a good kickstart and you supported me in a great way. I think you did a wonderful job in continuing this group of physicians who are interested in the veins. It’s nice to read about it and it’s wonderful to see how much this field has grown and what an impact it had also on the quality of vein treatments.